With less than a month left in Argentina, Tim and I have been trying to cross everything off of our “Argentina Bucket List.” It’s been a lot of fun, especially with the beautiful weather we’ve been having! It started a week ago, when we went with the interns to La Catedral in Buenos Aires. 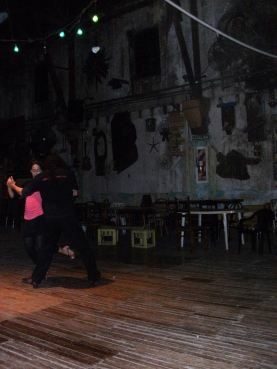 It’s essentially an old warehouse in the city where they give tango lessons and serve food. Since Argentina is known above all else for creating the tango, Tim and I had wanted to take an intro class on the dance. The venue was really cool, the instructors were great and there were people from all over the world. It was a lot of fun, even though neither of us were any good! Then Friday was the 128th anniversary of La Plata. Tim and I had one of the interns over for dinner and then we headed out to Plaza Moreno. The city put on a series of concerts that started with local bands and culminated with what felt like a never-ending set by Fito Paez. After the concert, there was a short light show followed by a somewhat impressive fireworks display. The whole evening really felt like the 4th of July with the hot weather, the families lounging together in the grass, the fireworks, the men selling glow-in-the-dark toys, and the hot dog vendors parked around the plaza. The next day, Tim and I went to Buenos Aires to do some touristy things that we still hadn’t done. 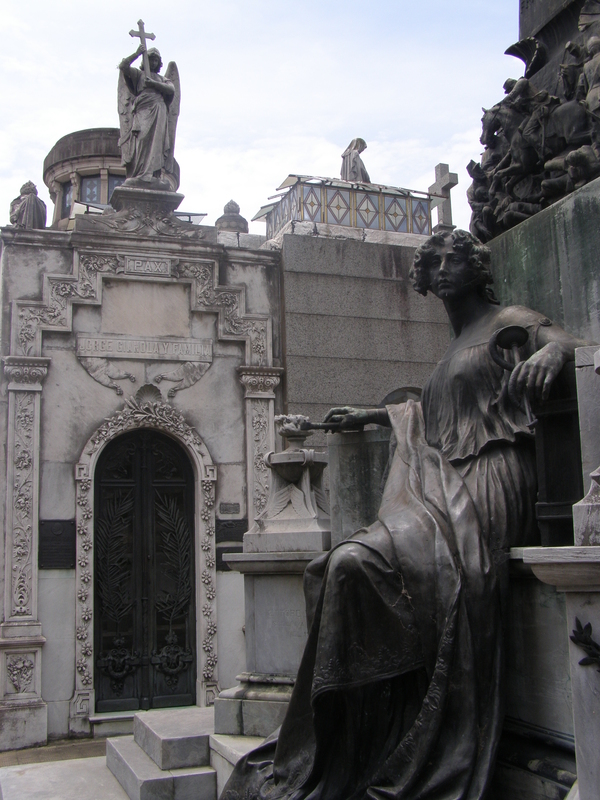 We started out in Recoleta, where we went to the famous cemetery and artisan fair. We then walked over to Palermo and spent some time in the MALBA, a wonderful art museum featuring Latin American artists. Afterward, we wandered through some of Palermo’s parks including the Japanese garden and the Botanical Garden. It was a really lovely day that made us both appreciate Buenos Aires’ beauty and culture. On Sunday, we went to a futbol game here in La Plata. There are two main teams based here– Gimnasia and Estudiantes– but the Estudiantes’ stadium is being worked on, meaning that they are currently playing their games in the nearby town of Quilmes. So, by default, we decided to see Gimnasia. Gimnasia, ranked second to last in the league, was playing Velez, the number one team, so we expected them to get crushed. 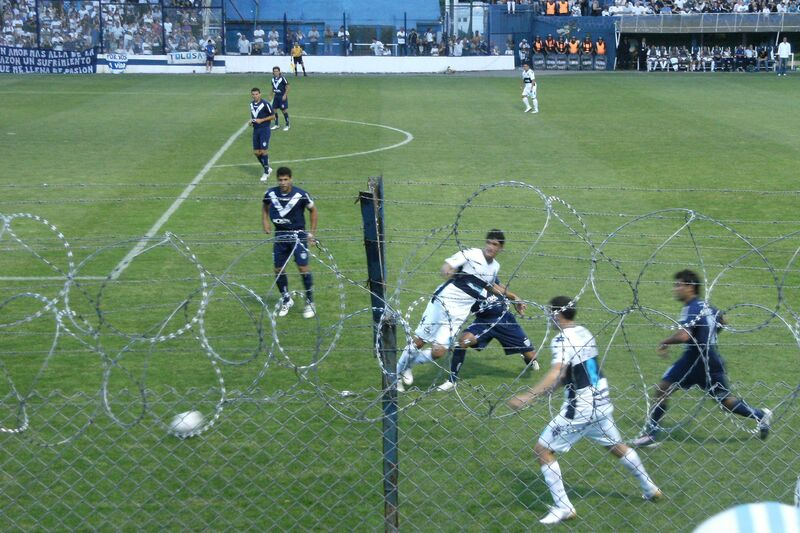 The game ended in a tie though, which was quite a victory for Gimnasia. We spent the duration of the game trying to learn the words to what seemed like millions of chants and mimicking the locals by yelling “QUE BOLUDO,” “PELOTUDO” and other insults as loudly as we could. All in all, a fairly successful outing. We still have a lot more to fit in before we leave, and I am definitely looking forward to all of it! We’ll try to update a few more times while we’re here. It’s been an exciting week for us! Last week I had orientation with a new group of interns– two undergrad students and two recent graduates, all from the US. We had the usual workshops and activities to help them get comfortable here and introduce them to FSD’s mission. I love orientation week– I get paid to play jeopardy, eat croissants and watch TED talks. Not a bad life. I also got to meet more of the host families and visit a couple of new organizations so I’m slowing getting to know everyone. While I was doing that, Tim found himself some (paid!) work. He had two interviews at English institutes that seem very promising. The semester ends mid-July so he would probably start at the beginning of the new term. He has also started teaching private English lessons so he’s starting to settle in here as well. His Spanish is getting more and more awesome by the week. He’s been getting a lot of well-deserved compliments on it this week! As if that wasn’t enough to keep us busy, we’ve been watching as many of the World Cup games as possible. No surprise that everyone is loco for soccer here. Yesterday Argentina beat Mexico, meaning that they advance to the quarter finals! If Argentina can manage to beat Germany on Saturday, they say the championship is as good as theirs. Watching the games has been a fun way to meet new people and spend more time with our host family and coworkers. We’ve learned a lot about soccer, the cultural norms around watching the games, and the selección (what they call the Argentine team, which is comprised of players with nicknames like The Flea, The Witch, The Gringo, etc!). We watched the US play this weekend too. We went to BA for the day to get Mexican (how I missed spicy food!! ), to watch the game and to check out an art festival that was in town for the weekend. And even though the US lost and it was pouring rain while we were there, we managed to have a really good time. When we got back to our house in the evening, our host family was throwing a huge party for the abuela, who turned 97 years old this week!! So we got home, ate some cake and then packed our suitcases because… we finally moved!! That’s right, yesterday we moved into our new apartment, and we couldn’t be happier about it. The apartment is soo bright and cheery! Lots and lots of natural light, plenty of space and a super friendly roommate. It felt like home right away. Today we are planning to go shopping to stock our shelves with some groceries and maybe buy a house plant or something. We still have a lot of exploring to do in our new neighborhood but yesterday we did go to the pizzeria across the street. Delicious! Like, all Argentine pizza, it needed more sauce… but otherwise, it was really good! That’s it for now. We’ll be sure to post pictures of the new apartment soon. And I’m going away for work next weekend, so I’m sure I’ll have a ton of photos from that.